Final units painted (Bulwarks need a little more work but playable). A late one with basing, which took longer than expected (and will have finishing touches at a later date). Right, time to pack and see if my men spend longer on the table than I fear they might! Pulled a little bit of a late one but both tactical squads are painted and everything else just requires markings and fine detail adding. Then it’s on to basing! Seemed to spend most of Wednesday evening prepping the missing tactical company, a couple more Trojans for command vehicles, and some old GW objective markers. Managed to get them undercoated this afternoon, but its going to have to be a paint fest this evening! Hectic day at work precipitated a short snooze on settling the children to bed. Productive couple of hours though with everything having been highlighted and all the infantry weapons have been re-blacked. One slight oversight is I thought I already had one painted tactical company…… and I don’t. So tomorrow’s first order of business is to prep another 30 marines. 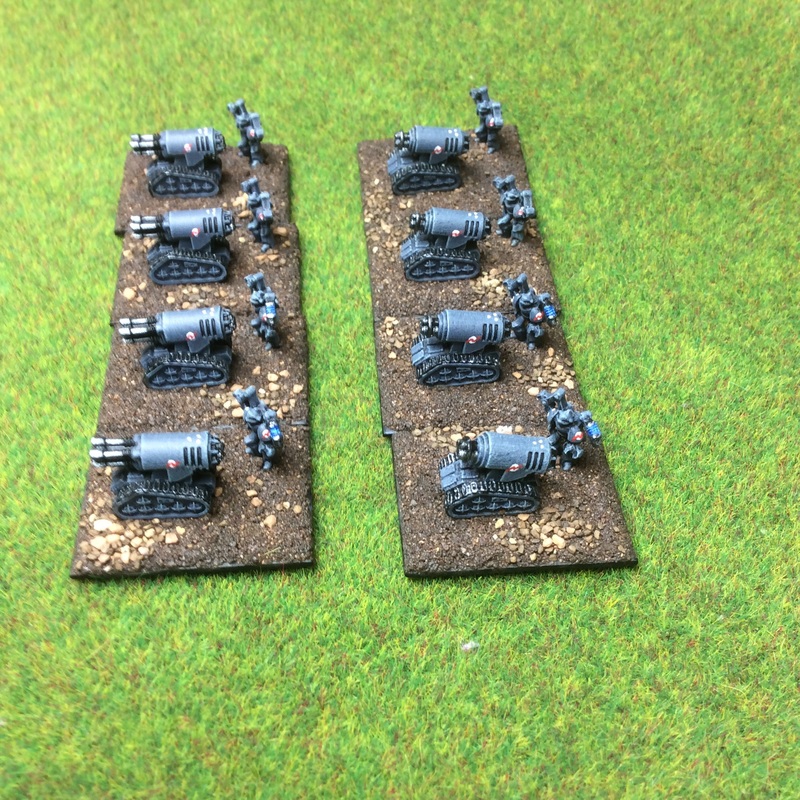 On another note I also managed to undercoat a pile of blast markers I picked up many years ago from Irregular Miniatures. Been a while but I thought I would share a project in rapid evolution! It’s 5 days to go until my first Epic competition ‘Full Scale Assault’ on the 20th! 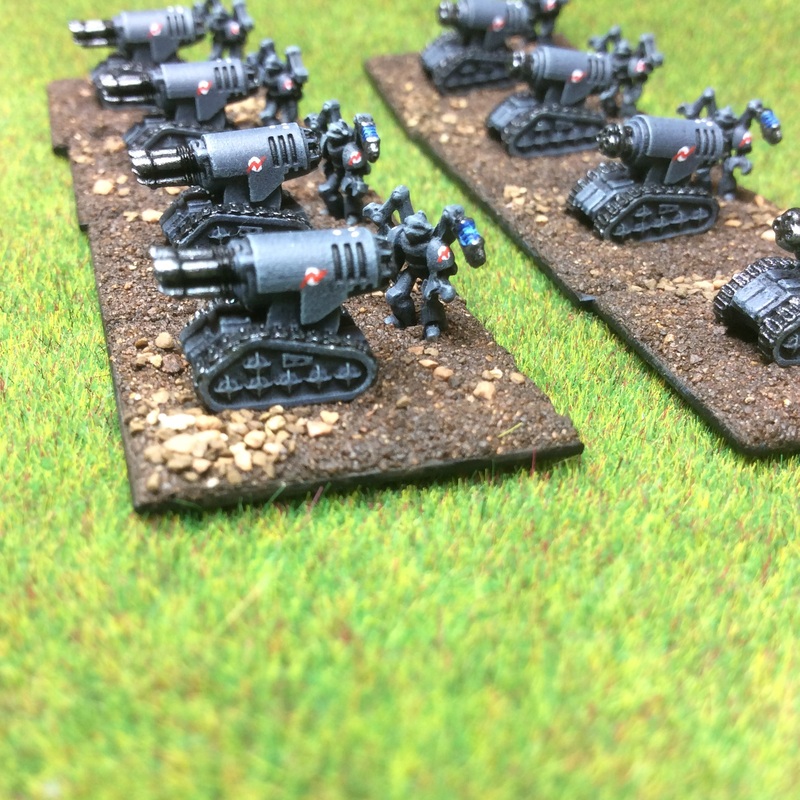 Some rapid painting is needed as I have decided to put together a Vanguard Miniatures (old TMG) Affray force for the competition which I will use as Codex Astartes force. I could of course use my old GW force, but heck that would not be a challenge! I had a rough idea what force I was going to field but finalised my list on Saturday. Having finished cleaning off the models I got around to undercoating them black yesterday (along with some extra stands I thought I may have need and had cleaned up). So five days to go and working late this evening. Even so I managed to watch ‘The Walking Dead’ and then put the base wet brush of Valejo 105 Lufwaffe Uniform on the models. Plans for tomorrow night is to get the highlights on and then progress a couple of units to completion of painting. Time for bed, early start at work in the morning…. A quiet month on the gaming and modelling front due to the annual November appraisal yet again loosing me 2-3 weeks of my ‘spare time’. A big thanks to Dr Shipman for his psychopathic tendencies landing us with that one! Anyway I was working on a couple of command figure conversions for a decent fellow in Belgium. Managed to get them finished recently. A little remiss I did not take more photos along they way, but then There are others I would like to do. First up was a straight clean up of a metal Chaplain from the Character set. This is sat next to a character with jumpack. Simple enough conversion with the base of a Seargeant marine, with a liberated backpack from an assault marine, sporting a ‘stormshield’ liberated from a beastmen. Slightly more involved was the three bike conversions. Essentially a chop shop job. Torso of a Chaplain onto waist and legs of a biker. As I have started doing the Chaplains mace handle has been replaced by a 0.53mm pin as they break far too often. Another half and half chop shop with a commander and biker. Cloak sculpted over the rear of the bike, and right arm to handlebars sculpted. Slightly more involved. Half and half chop shop as ever. Neither hand really works as a biker so both hands been reworked. The right sculpted to the handlebars. The left recieved a new staff and left arm, the staff topped with a raven (I assumed use with Ravenwing as these are off to lead their Dark Angel brethren). 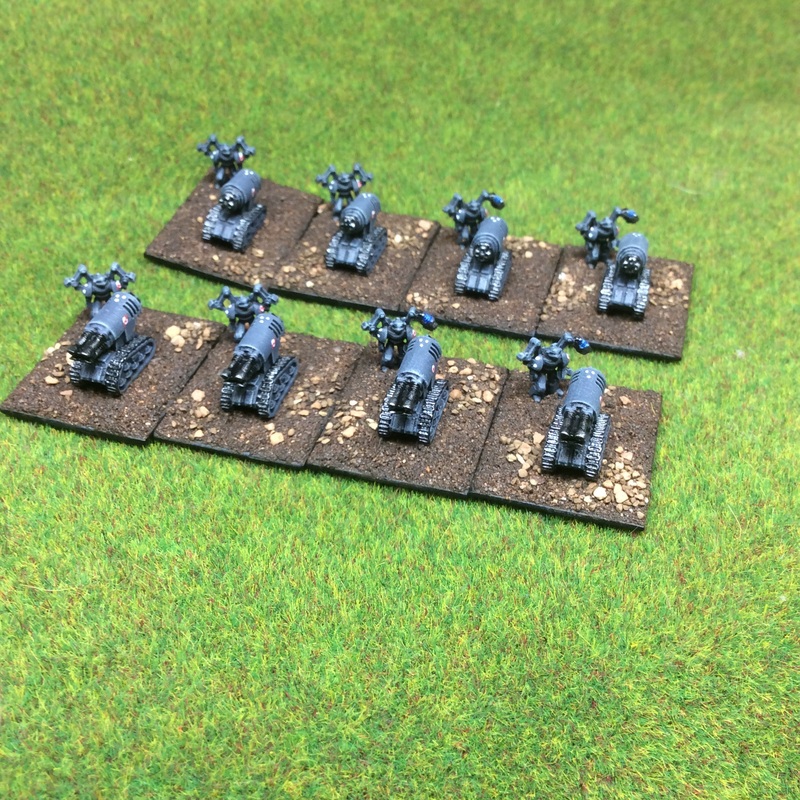 After a couple of distractions last week I have got around to painting some of the Affray support weapon teams. Think they make ready proxies for Thunderfire cannons and Rapier Quad Lasers. Same painting scheme I used previously. Again very clean casts although something is not quite right with the casting of the lower two barrels on the quad lasers (not that you would notice from above and at gaming distance!). 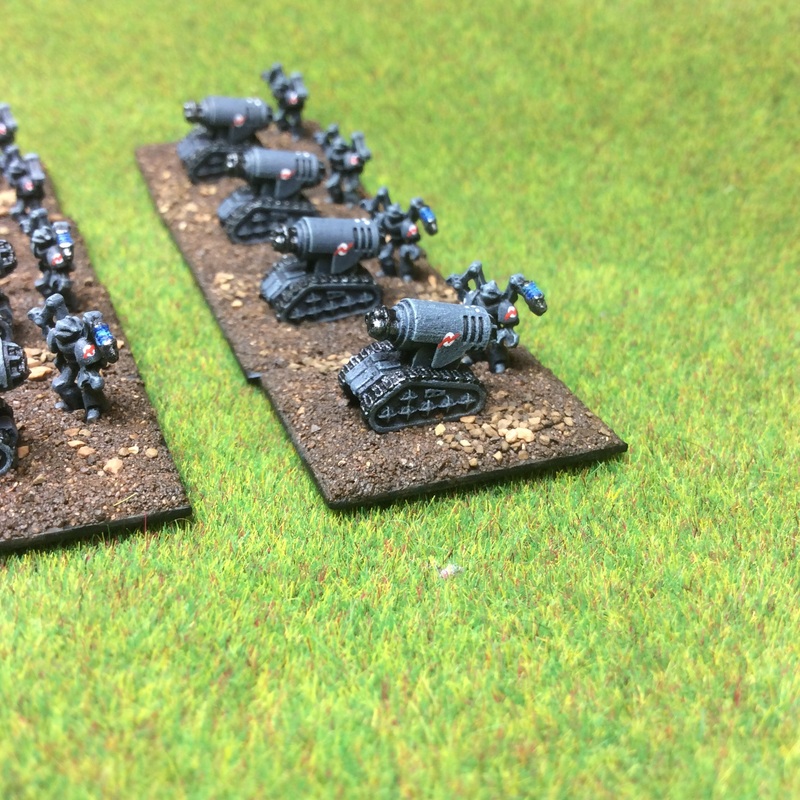 I am a bit remiss as I clearly need some normal squads to expand this force, but those quad bikers have a certain draw…..
On other news TMG have farmed the selling and distribution out to Vanguard miniatures (http://vanguardminiatures.co.uk). Already ordered some more sampler packs of the Onslaught range to show my support.